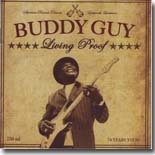 Buddy Guy keeps getting better with age, as can be heard on his latest CD, Living Proof. It's this month's Pick Hit. You may not be familiar with Kirsten Thien, but you'll want to search for her third release, Delicious. It's this month's Surprise feature CD. This month's Flashback goes back to 1985 for the very excellent Antone's Tenth Anniversary Anthology, Volume 1, featuring blues legends Buddy Guy, James Cotton, Snooky Pryor, Jimmy Rogers, and more. Our What's New section features new releases from Robert Randolph and the Family Band, Chick Willis, Les Copeland, Claude Hay, Ken Tucker, Andy Cohen, Joe Louis Walker, and more.